Nothing beats a lazy Saturday or Sunday started with a good breakfast! Last week I decided to go to an independent place in Chester called Atina Kitchen as it was highly rated on TripAdvisor. 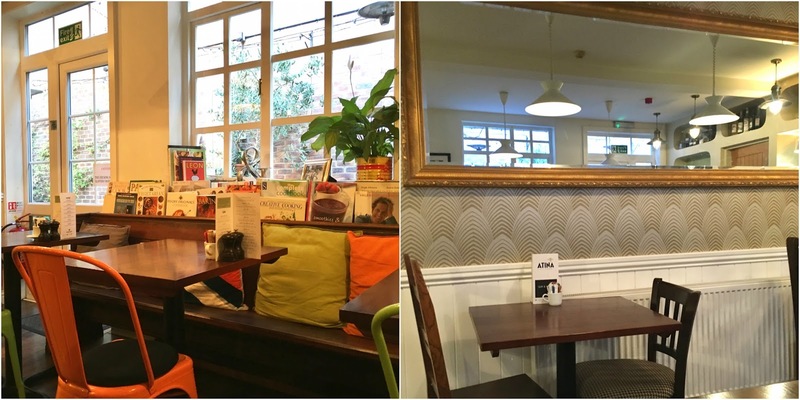 "Atina Kitchen is an eclectic, family run restaurant featuring Italian cuisine with contemporary British twists. 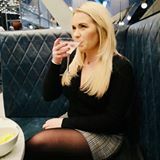 The name Atina is part of our family’s Italian heritage and we feel that this is epitomised by our ever changing breakfast, brunch, lunch and dinner menus you will find in our restaurant which is ideally located at the heart of the city of Chester." From the outside it looks like a small, quirky cafe but inside there is a corridor that leads to a further dining area which makes it quite a large place! The decor is tastefully thought out with books, ornaments and kilner jars full of ingredients scattered from floor to ceiling, it's what you would imaging an Italian family restaurant looks like. 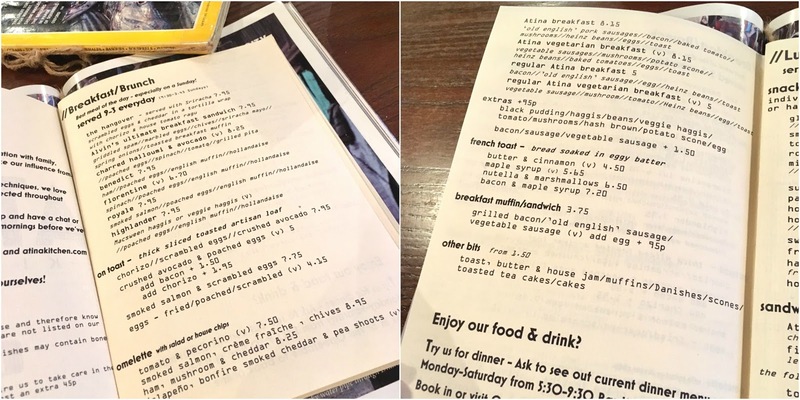 The breakfast menu is quite extensive and even the menu is presented in a quirky way, nestled inside a National Geographic magazine. I was torn between a full English or something different, but eventually I decided on the Attina Breakfast (£7.85) - the typical full English, and my friend (who is a vegetarian) went for the veggie alternative (£7.85). The food was freshly prepared, we could see the chef preparing out breakfast through the small hatch at the back of the room and it came out to us in a good time while we were sipping our delicious latte. My breakfast (Atina breakfast) included two pork and leek sausages, two rashers of bacon, two poached eggs (you can choose what eggs you want), mushrooms, beans, a baked tomato and thickly sliced fresh toast. 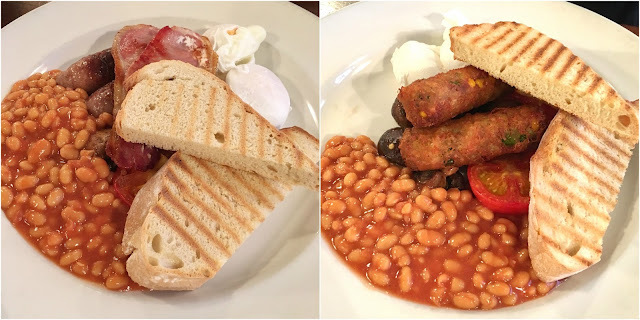 I did really enjoy the breakfast however the sausages were extremely heavy so I could only eat one - and I love food - I could tell they were really good quality but just too much for me. The vegetarian breakfast was the same as mine however his sausages were veggie sausages and he had an addition of a potato scone which was really tasty! It's really great to see restaurants catering for vegetarians and putting something 'different' on the plate as some places just fill it with eggs or extra mushrooms so it was a welcome extra. Overall it was a nice breakfast however next time I visit I will definitely be opting for something more adventurous like The Hangover - scrambled eggs & cheddar in a tortilla wrap with chorizo & house tomato ragu (£7.95). Atina Kitchen do an delicious looking lunch and evening menu which I would be very keen to try out as the ingredients used are of a high quality and carefully presented in comfortable and cosy surroundings. I would definitely recommend going into Atina Kitchen if you are looking for an independent eatery in the heart of Chester city centre. If you are happy to travel a little bit further out of the centre of the city then you must visit Cafe Fude (REVIEW HERE). Do you like to visit independent places or do you prefer high street chains?